hey calin, were you able to use subinterfaces on the CSR1000v? traffic between two router subinterface with dot1q tagging doesn’t seem to work for me. Any idea? After many hours of heartache, I have found a solution that worked for me! All I had to do was right-click the CSR1000v instance in Eve Ng -> Edit. In the middle of the “Edit Node” dialogue box, there are options to set the QEMU Version/Arch/Nic. I set the “QEMU Nic” to “vmxnet3” (it defaulted to tpl(e1000)). Now my CSRs can talk to each other through their DOT1Q sub-interfaces! They can also do so when cabled directly to each other (couldn’t before changed the above settings). I hope this helps someone else from going through the pain I did! having the same problem as netninja, dot1q traffic dont pass between CSR routers. Untagged traffic works fine. Hi the downloaded files seem to have corrupted as they contain no data. Perhaps you can share it again? Thanks! 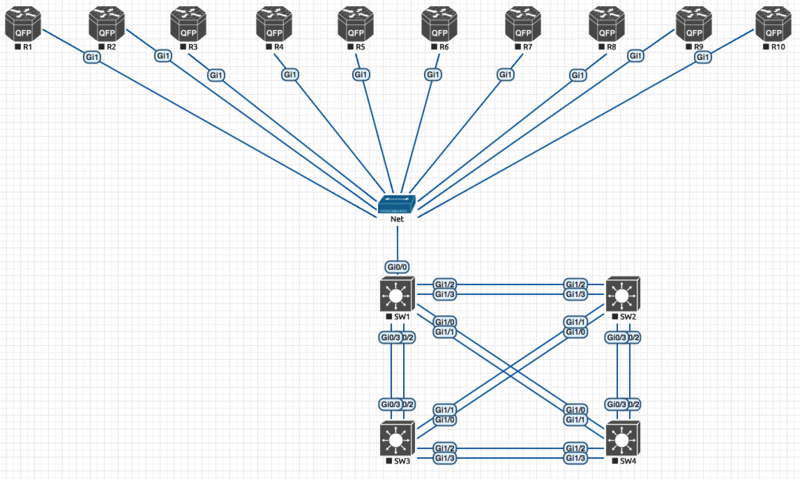 Not trying to steal views or anything (my blog is not and will not be monetized), but check out my topologies/configs. Very similar to Calin’s (gave him credit because I saw this first), but with some nice improvements to configuration management. It includes topologies and configs for IOU/IOSv/CSR1000v along with specially formatted configs to allow you to quickly switch between initial configs. I am using the CSR1000v topology for my CCIE studies and I love it.